The 2012 Farwest Show will present three special themed nursery tours — “Gen(i)us Acer,” “In the Shadow of Mt. Hood,” and “New Plant Trials.” The tours are scheduled in the two days immediately preceding the show — Tuesday and Wednesday, Aug. 21–22. The show itself will be Thursday–Saturday, Aug. 23–25, at the Oregon Convention Center in Portland, Ore.
“Gen(i)us Acer” will take place Aug. 21. The tour will complement the two educational displays on maples that will be on Farwest the show floor. There will be stops at five different nurseries. “In the Shadow of Mt. Hood,” on Aug. 22, will feature small, medium and large conifer and shade tree growers, a bare root production nursery and a cedar box and retail display manufacturer. “New Plant Trials,” also Aug. 22, will include stops at annual and basket growing operations and The Oregon Garden and its 15 trial gardens. That’s not all. The tour also will visit a top Portland garden center and one of Oregon’s most innovative florist azalea nurseries (which may also be one of the country’s largest). The tours will travel on luxury motor coaches. They will leave the Oregon Convention Center promptly at 8 a.m. and return by 6 p.m. Organizers will provide lunch, beverages and snacks for all participants. In addition, all tour participants will receive a free Expo Pass to visit the Farwest Show floor. The cost is $80 per person before July 31 or $115 for those who sign up after that. 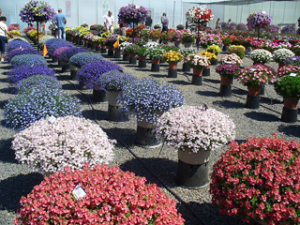 To register, log on to www.farwestshow.com/nurserytours.